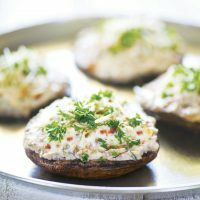 Stuffed mushrooms with lush, creamy ricotta cheese, paired with a light, fresh prosecco makes for an easy, satisfying appetizer. This recipe is from the new cookbook Paired by Fran Flynn and David Stevens-Castro. 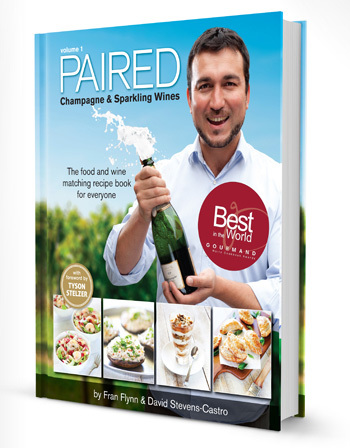 Back in October, I was asked to review a cookbook of food and champagne/sparkling wine pairings. I agreed, because I was interested in learning more myself, as I often have no clue what makes one wine better to serve with a dish over another. First, the basics: the authors are food photographer Fran Flynn and wine expert David Stevens-Castro, a husband and wife team who live in Australia. The book is 150 pages, laid out in 7 chapters, each chapter dedicated to one kind of sparkling wine and the recipes that pair best with it. The recipes include both imperial (cups and fluid ounces) and metric (grams and millileters) measurements. This book explained a lot about wine and food pairing. For example, there are 5 anticipated results when choosing a wine to pair with food: do you want to cleanse, complement, parallel, counterbalance or enhance? There are two pages dedicated to wines of the world, and how the styles and flavors of those wines differ by region. 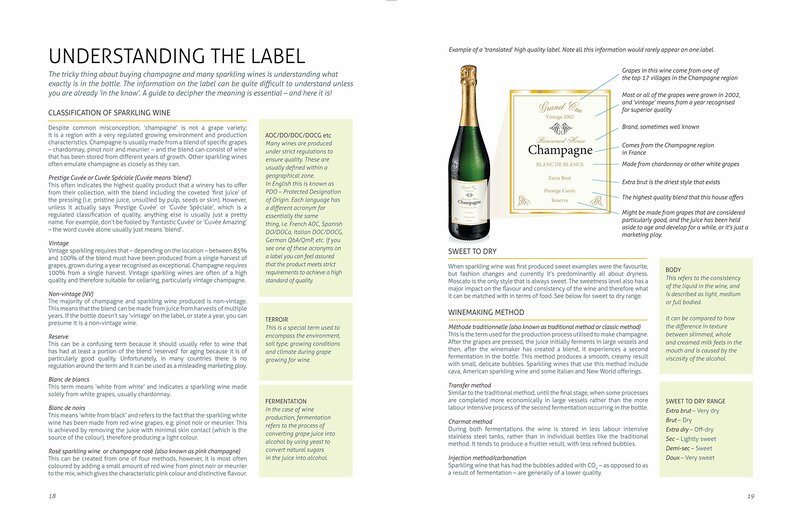 The section that I found most useful in this book was “Understanding the Label.” I look for sparkling wine recommendations before going to the store, but if my local store is out or doesn’t stock it, I’m lost when it comes to finding something else. With this guide, I can find something similar by understanding the terms on the label. For information on how to purchase this book, see below the recipe. 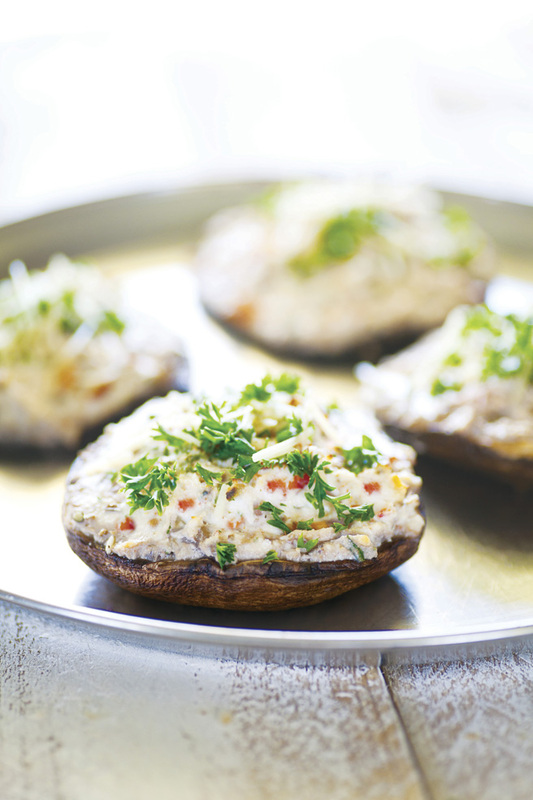 Large juicy portabello mushrooms stuffed with lush, creamy ricotta cheese, paired with a light, fresh prosecco – it’s an easy and very pleasurable combination. This dish even sports the colours of Italy, as well as a sense of Italian flavours. It’s also an ideal share dish and surprisingly rich too. Usually one large mushroom per person is enough for a satisfying starter. This is a classic example of ‘what grows together goes together’ with the Italian influence of the dish matching nicely with the Italian wine. A light easy-drinking non-vintage prosecco beautifully cleanses the palate after the richness of the ricotta. The potentially strong flavours of the onion, sun-dried tomato and parmesan are pleasantly restrained by the acidity of the wine. Preheat oven to 190°C/375°F. Mix ricotta, sun-dried tomatoes and finely chopped parsley in a bowl and put to one side. Remove the stems of the mushrooms and finely chop. Gently fry with onion and garlic until just softened. Allow to cool slightly and then add to ricotta blend and mix fully. Re-grease the same pan with a little bit of oil, to seal the mushrooms. Put on a high heat, add a few drops of water and place a large saucepan lid propped at an angle over the mushrooms to increase humidity and prevent drying while frying. Fry for about a minute each side. Once sealed, place mushrooms in an oven dish on a layer of baking paper and heap with ricotta mix, until all mushrooms have a dome of the ricotta blend on top. Sprinkle with some parmesan. Bake for 20–25 minutes or until tender. Transfer to a wire tray and top with some freshly chopped parsley, salt and pepper and a little bit more parmesan. Serve immediately. Thank you for your lovely review. We’re delighted that you’ve enjoyed our book.